Sure. With this economy we need any push we can get. Buy stuff. Buy stuff. Buy stuff!!! Who doesn’t like a good deal? I know I do. These days money is tight and many of us are questioning whether we really need that latte this morning or should I buy the store brand gallon of milk to save 60 cents. BUT WHO ARE THESE RETARDS who are getting to the stores at midnight so that they can save $50 on a $800 flatscreen or be guaranteed that you get the hot Elmo-Jerks-Himself-Off for your two year-old who’d be happy playing with an empty box? Come on. 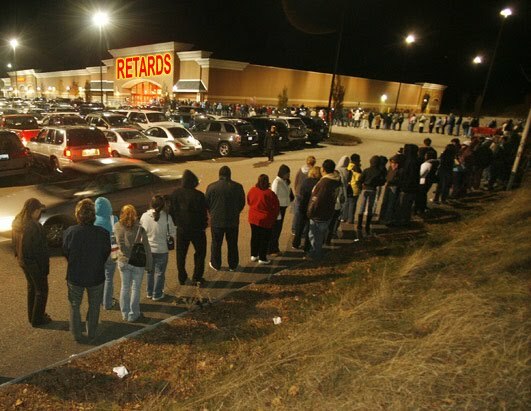 I had a couple friends call me to let me know of their Black Friday Adventures. How they got there, found what they needed in the first twenty minutes then spent 2-3 hours in the checkout line. I’m certain there are worse places to be, but for me, I would have to compare it to something out of Dante’s Inferno. Now for those of you who partake in Cyber Monday: Right On. In fact, do it while you’re at work. Stick it to the man! Make money while you save money. Just don’t tell us about how awesome it was.